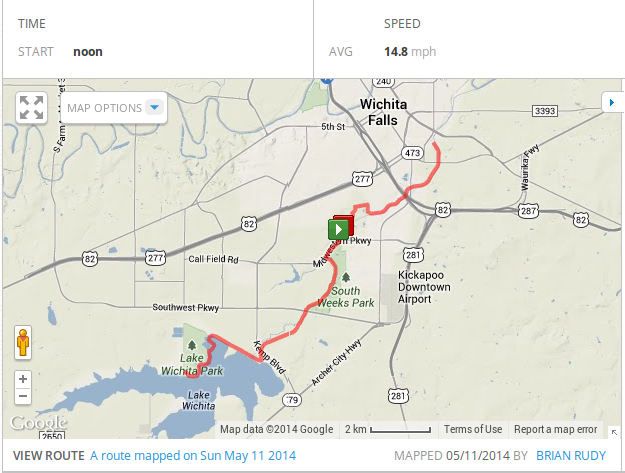 I really like the bike trails that we have here, today was a perfect day to ride, almost no one out fighting the wind. Just as I would expect it to be on the day of the ride, the wind quartered about half way through and I ended up fighting it about three quarters of the time. I will have to start riding in the evening as well to get in the amount of saddle time I want to work up to. One other thing, if you plan on doing any endurance riding at all, do yourself a favor and get your bike set up just for you. I cannot tell you how much more comfortable it is to ride a bike that fits. I have gone through 3 major saddle upgrades in the past three years and each one took about a month to get used to. You sure don’t want to make a major change in the way you ride right before a big event, you want to be really used to the bike when you are going to be spending a lot of time on it. The route I took today is becoming a favorite, it is about an hour long without wind and it favors the way I like to train, I never stop. 18.5 miles with two turnarounds and never came out of the pedals. That is the way I will ride in August, this jaunt is just about two rest stops worth, I want to add another thirty miles to this before the ride. Also need to work on speed, this tempo would get me 59.2 miles by 11:30, probably 20 miles short of Hells Gate, something to think about but then it is the first training ride of the season.